Mastering Life is for people from all ages and walks of life who are seeking divine truth on how to get the good out of life. It will bring solutions to areas of personal challenge by teaching the individual how to produce enjoyable, peaceful and abundant living conditions, in every area of life – spiritually, mentally, physically, socially, and financially. Mastering Life connects the individual with the Infinite and unites him/her with divine purpose; it shows the reader how to use their minds and hearts to intentionally create a peaceful and prosperous life; it empowers the reader with wisdom for self-control that leads to true freedom; it equips the individual with the tools to build and maintain wholesome relationships; it assists the reader with a financial understanding and system that leads to true wealth. 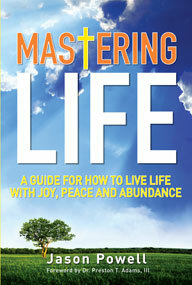 Mastering Life emphasizes the awareness that God lives in humanity. The recognition of this indwelling Presence is the catalyst that activates this dormant Power in everyone and resurrects Christ in the individual as his/her divine ability for masterful living.